As per sthalapurana, the Saptarishis refused to receive dhan (alms) from King Vrishadharbi, son of Sibi Chakravarthy as they thought it was a sin to receive alms from the kings. The king tried to lure them in many ways and subsequently arranged to kill them. The Lord saved the rishis by killing kritiyai through Indra. The Saptarishis proclaimed that Sriman Narayana is the Paradevata and the Lord took the name Mayapiran at this place. Theertham - Bragya Saras, Poonchunai Theertham. Nammalwar - 3535 - 3545. The Moolavar of this sthalam is Maayapiran. Moolavar is found in Nindra Thirukkolam facing his Thirumugham along the East direction. 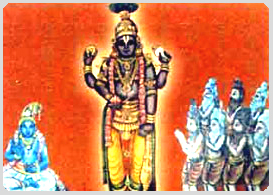 Prathyaksham for Sapta Rishis (7 Rishis). This sthalam is situated 3 1/2 kms away from Sengannoor in west. We can reach this sthalam by getting down in Sengannoor railway station which is found on the railway lane between Trivandrum (Thiruvanandhapuram) to Kollam via Ernakulam. There is no lodging facility.